You could consider the springs used in your garage door as the backbone of your system. They are responsible for maintaining the balance of your door and are responsible for the heavy lifting when it comes to the opening and closing of your door. 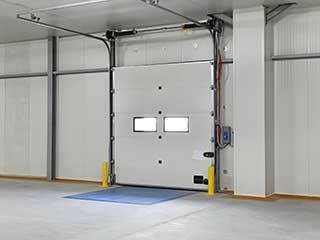 An immense amount of caution needs to be exercised when handling garage door springs. Many accidents and injuries have been recorded because the person handling this component did not understand the gravity of force involved in the functioning of the springs. Only well qualified, expert and experienced garage door service providers will fully appreciate the technicalities here so please rely on us for any re-balancing, alignment or spring replacement you're in need of. Standard torsion springs are common in many residential garage doors. While all springs power your door's movement by creation tension that translates to stored energy, torsion springs achieve this via torque rather than stretching out. In other words, they twist up to store the energy - in general, we tend to prefer torsion springs as they tend to last longer and be a bit safer. Torsion types are usually mounted to the spring anchor bracket in the centre of the shaft right above the garage door. If a door is light weight, then only one torsion spring is likely to be used. If the garage door is particularly heavy in weight, then two springs can be used. Extension springs are the other common type of garage door spring - they are usually mounted on the sides of the door or above the horizontal tracks of the door. Extension springs contract and expand during the lifting and lowering of the door. If one of your extension springs is considerably worn or broken, you will need to arrange the replacement of both to maintain balance and the correct tension. We can carry out any repairs or replacements needed for this type of spring as well as for torsion types. If there is a problem with your spring, you should be careful around your garage door as these components can be particularly dangerous if they suddenly snap. In particular, you should ensure no children have access to the area - safety is always best! If you are living in the San Tan Valley, then contact our professionals for spring repair and replacement services you can trust - we'll be glad to talk to you and provide you with the best course of action.